Stuffed Bear Surveillance | OhGizmo! Another day, another teeny camera hidden away somewhere unexpected. This time it’s a high resolution (NTSC or PAL) CMOS sensor stashed inside your standard teddy bear. It has a built in 2.4 GHz transmitter which will allow you to monitor the camera VIA the included hand held remote’s 1.5 inch screen. Or the signal can be sent to a TV or VCR/Computer to be recorded for later review. The bear also has infrared illumination to facilitate a clear image even in a dark room. 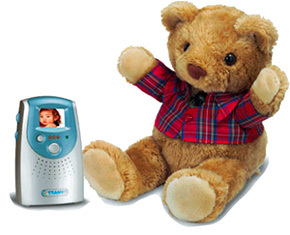 You too can enjoy camera-equipped-plush-bear-peace-of-mind for $174.95 from Sewell Direct. Long term exposure to 2.4 GHz transmitter cool!!! Expose them when they are young.